Yes, there really are wild turkeys… *drools*… Unfortunately I have never been up close to one, as mum and dad won’t let me chase them. Spoilsports! Do you like this westie cartoon? There are more westie smiles where this came from! 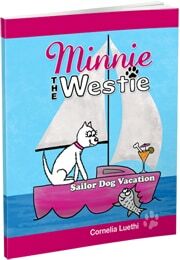 This cartoon is from my book ‘Minnie The Westie – Sailor Dog Vacation’… check it out on Amazon.com and other online bookstores!